Greater Philadelphia Bicycle News: Commerce Bank Bike Philly 2008 a Success! Commerce Bank Bike Philly 2008 a Success! 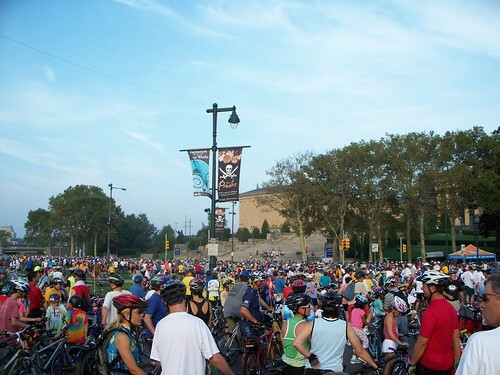 Bicycle Coalition staff are still recovering from yesterday's Commerce Bank Bike Philly event, but we hope that you had a good time if were one of the 3000 bicyclists who rode yesterday. We'll report soon on the highlights as soon as we catch up on our sleep. In the meantime, read about Commerce Bank Bike Philly in today's Inquirer and listen for a story on WHYY. Also, if you took any photos from the ride that you want to share, please join our Flickr Bike Philly 2008 group. It's very easy to share your photos if you upload them to your own Flickr account. Check out the photos even if you don't have an account! What a wonderful ride! I had a great time. The 50 miler was beautiful, fun and challenging (hilly!) which allowed for some great speed (40mph+) which I think was legal. Congratulations for putting on a great event. PS - What happened to the Mayor's announcement about the bike/ped coordinator position? THIS IS A BEAUTIFUL SIGHT! Congratulations on such a great turn-out! Andy B we are still awaiting an announcement from the Mayor's Office for this position. This may occur next week.